RATHER THAN JUST ANOTHER DAY OF PRAYER, a ‘Season of Prayer’ has been called for across the UK Christian retail trade, commencing on Ash Wednesday, 9th March 2011, and running throughout Lent. It is suggested that shops host their own prayer meeting on that day and take the opportunity to launch a season of prayer, encouraging the local Christian community to make our trade a part of their devotions throughout Lent. 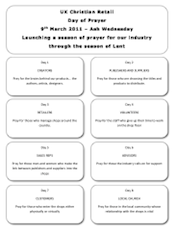 In this way prayer for local retailers and others in the trade could remain on the prayer cycle throughout Lent. Lent is typically a time when many Christians take additional time out to pray, often using Lent resources purchased from their local Christian retailer. This provides the opportunity for retailers to encourage their customers to commit to pray for the continuing presence of Christian retailing in the marketplace. As with previous Days of Prayer (see below), specific prayer requests and notices may be posted here. As noted in Christian Marketplace, plans may also be shared in the Christian Authors, Booksellers and Publishers facebook group, but please note that is a closed group: information posted there will not be available to non-members.